I had many reservations about going to Bali, primarily that it would be an over-priced tourist haven. It's clear that the island has benefited greatly from the international blockbuster "Eat, Pray, Love", however inaccurate of a portrayal it may have been. I sure hope soul-searching women are not flocking to Ubud expecting that they can ride a bicycle to the beach. We picked to stay in Ubud because we wanted a central place to explore central Bali. We had no interest in going to the beaches after hearing that they are not the nicest, and believe me our last day proved it. We stayed at the Ubud ArtVilla that had a beautiful natural pool, view of a Mount Agung volcano, a waterfall shower in the bathroom and amazing breakfast. The best part of the breakfast was discovering dardar gulung (pictured below). Dardar gulung is snack of toasted coconut filling rolled in a rice pancake that is colored green from pandan leaves. This is my kind of breakfast pancake. Among the ~20,000 Balinese Hindu temples, we could only visit Tirta Empul and Besakih. 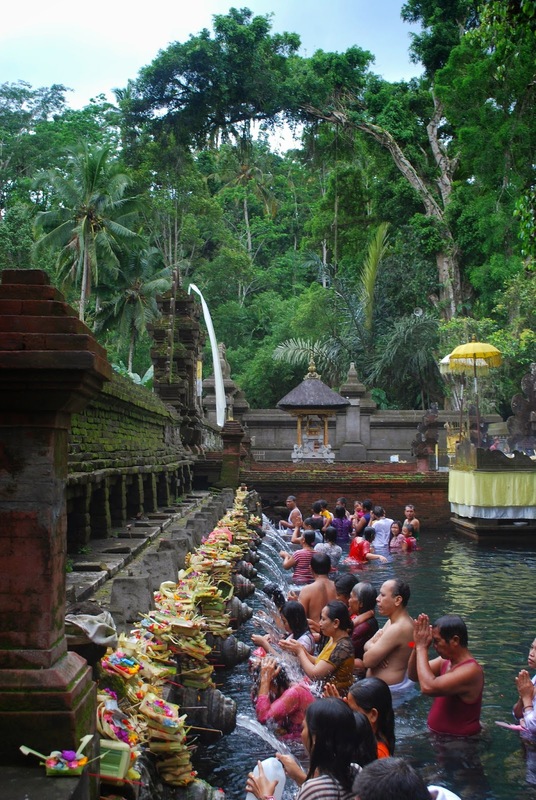 Tirta Empul is famous for its holy water. Besakih, translated to Mother, is the largest and most important temple in Bali. Of all the temples I've visited, these were among the largest but were also the most crowded with worshippers. The Monkey Forest in Ubud doesn't disappoint with the abundance of monkeys, but apart from that it's also a really beautiful forest. Bali also has some stunning rice terraces. Dadar gulung was just the beginning of the food tour. For good local food, head to any of the many warungs, such as Warung Mendez, located next to the ArtVilla. The nasi goreng and popular goat soup/curry were both delicious. I'm constantly amazed by how many ways there are to make fried rice. One signature local dish is crispy duck, and Bebek Bengil is one place to get it. The duck itself was extra crispy and delicious, though I do wish it had more meat on it. Unfortunately, my pictures from this dinner were bad quality due to the lighting. The restaurant has a huge outdoor garden with lots of comfortable seating. It's a lovely way to end an evening. For lunch one day, we stumbled upon Dapur Bunda. It is an adorable cafe near the Ubud Palace serving home cooked food. You can customize your plate by picking the type of rice and sides/meats. Of course, if you're feeling sluggish, go to a coffee plantation for a tasting where you can try the famously expensive coffee luwak. Straight from the poop of luwak cats, this coffee will surely wake you up. Everyone we met, from the villa owner to our driver to restaurant staff to tour guides, were so friendly and hospitable. (Except for the usual people who tried to scam and get money from us, obviously). I felt so comfortable there I nearly forgot that we were far from home. I'm stopped this list at 5 because it seems like a good round number, even though I could go on about the relaxing atmosphere and spas. After one day my pre-conceived notions about Bali were reversed, and after three days I had decided that I want to go back.